Our first fundraiser collected donations in exchange for beautiful silver bracelets that were designed by Red Pennies. All proceeds were donated to the Parkinson’s Disease Working Group in the Neuroscience Institute at Stanford University Medical School to support research, education, and training in Parkinson’s Disease. This bracelet was designed to represent health, vitality, and hope. 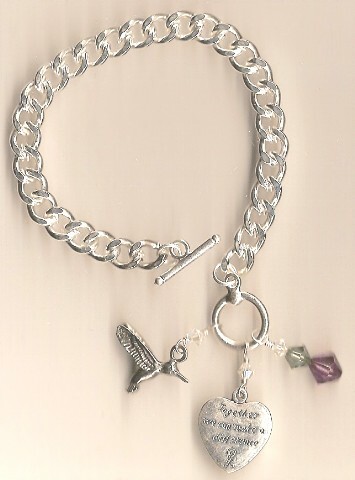 The heart charm displays the silver ribbon – the ribbon for Parkinson’s patients. The hummingbird has always been a meaningful symbol of healing to Pamela’s family, while the color purple represents strength and well-being. The chain is silver plated alloy. The hummingbird charm is made from a sterling silver and lead-free pewter mix. The crystals are genuine Swarovski crystals from Austria. Unfortunately, we have sold out of our hummingbird bracelets! To make a donation to help support Parkinson’s Disease Research, please click the “Donate” button below. Again, we are sorry, but no bracelets are available at this time.